Did you know that over 85% of pets over one year of age have some degree of dental disease? Just as people need routine dental scaling, so do our pets. Most animals need their first professional cleaning when they reach 3-5 years of age. A general anesthetic is required to thouroughly clean above and below the gumline and also ensures that no water or debris can be aspirated into the lungs during the procedure. As pets age they may require more extensive dental care. Dental x-rays can help determine the underlying condition of damaged or decaying teeth. Any necessary extractions can them be completed at the same time as the scaling. More extensive procedures such as root canals, which can save a potenially viable tooth that has been fractured can be referred to a veterinary dental specialist at the Vet College. After a dental cleaning your pet will not only smell better but feel better as tartar is no longer iritating the gumline. Dental care is also important for overall health as bacteria from the mouth can enter the bloodstream when tartar is present at the gumline and lead to serious kidney, liver and heart disease. 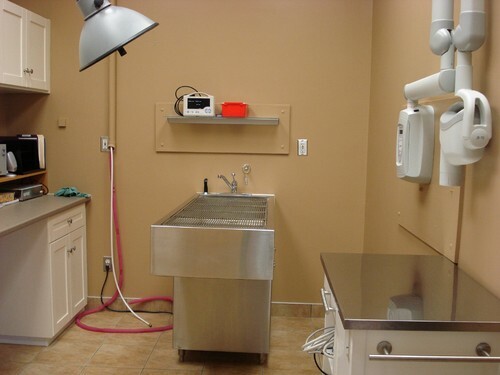 To see what happens at a day at the pet dentist, take a look at our dentistry photo album the next time you’re in the clinic.